ALLEGRA BOVERMAN/Staff photo. Gloucester Daily Times. Gloucester: The Cape Ann Vernal Pond Team paid a visit to Beeman Elementary School on Friday afternoon and brought many snakes with them to demonstrate and talk about with the students and staff. 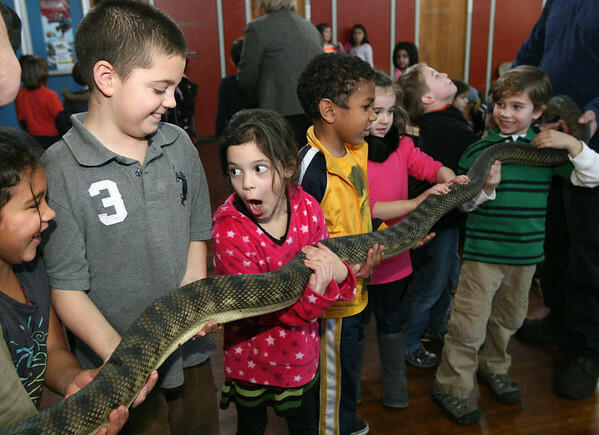 Holding and reacting to the 12-foot long Amethystine Python from Australia are, from left: Trinity O'Leary, Marcus Baxter and Alyssa Brown.